Imagine a large room filled with colorful mats, balloons in every shade of the rainbow and games, songs and apparatus specifically designed for the enjoyment and development of young children. Imagine getting help with your newborn about difficulties others had dismissed as "normal" baby problems. Imagine advice that really WORKS for you and your baby. Imagine a friend in the form of an early child development expert who makes herself available to you whenever you have the need, be it your baby's sleep problems, childproofing your home, discrepancies in his or her early mental and physical development, temper tantrums and other behavioral difficulties or just about anything else that becomes an obstacle in the enjoyment of your child. I have good news! There IS such a place, and it is WEE WORKOUT in Los Osos, run by Marlene Rosen. A good friend introduced me to WEE WORKOUT when my son was just six weeks old. He was tiny and frequently suffered with terrible gas pains which caused him to pull up his knees and cry with pain. Marlene observed this behavior, noticed it occurred after he nursed, and did a thorough analysis of my daily diet. She pointed out the abundance of gassy and acidic foods I was eating and explained how they were creating havoc in my son's immature digestive system. When I omitted these foods from my diet, my son no longer suffered stomach distress, and soon he nursed more vigorously, rapidly gained weight and blossomed, so much happier now that he was comfortable. My pediatrician had dismissed his pains as "colic", the catchall phrase for nearly all newborn gastric upsets, and told me my diet was not related. I was eternally grateful to Marlene for her excellent insight and advice. I soon discovered this was just the beginning of Marlene's helpfulness. She taught us songs to sing with our babies, combined with light flexing and stretching exercises, massage to relax and calm them, positions to strengthen their necks and upper bodies for the all-important crawling phase, visually stimulating toys we could make ourselves, and how-to information on all areas of baby necessities such as bathing, traveling, shopping, etc. She was (and is!) a wealth of practical, wise, and very useful information. My son, Sean, is now almost 20 months old, and we still go to Wee Workout every week. The positive atmosphere is so encouraging, and the regular WEE WORKOUT kids are happy, bright, alert youngsters, willing and anxious to learn. The social skills they adopt as part of the WEE WORKOUT program are invaluable; sharing, playing together non-aggressively, waiting their turns, etc. The drive IS a long one from the North County, but few things you do with your child could be so beneficial...well worth the time involved! 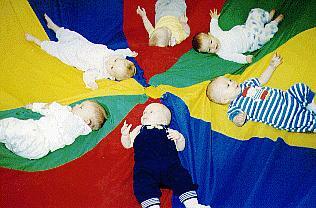 Call Marlene at 528-6665 to inquire about classes, from Expectant Moms through 5 year olds. There is a class for every level from pre-birth all the way to kindergarten. I'm Judy Schermerhorn and I'll see you there!